For Ahmed Elayan, an IT project manager, work is a mix of home-based preparation and far-flung, exotic travel. 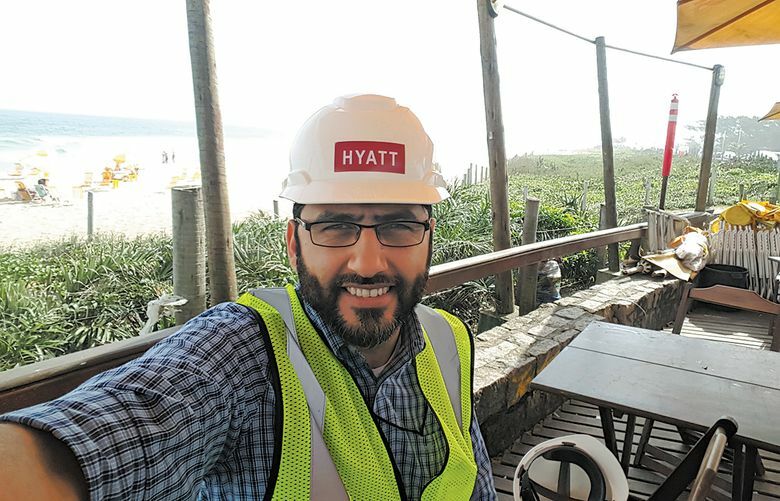 Meet Ahmed Elayan, an IT project manager for Hyatt Hotels who works from his home near Seattle. What do you do? I’m in IT project management and technical support for Hyatt Hotels Corp., making sure the IT side is ready for new hotels, as well as existing properties that are being converted to the Hyatt brand. How did you get started in that field? There was an opening for an IT analyst at the Grand Hyatt in Amman in Jordan. I applied on Thursday and started working on Saturday! That was 15 years ago. Where are some of the most interesting places you have been for work? I opened a hotel in Oubaai, South Africa, which has amazing nature and beaches. Another amazing location and hotel was in Andaz Papagayo in Costa Rica. Also incredible: Rio de Janeiro, Andaz Maui in Hawaii and Zanzibar. What’s a typical day like? When I’m not traveling, I wake up at 4–4:30 and go for a run or to the gym for an hour. I’ll come home around 6, get breakfast ready for my son and wife, go have a shower while coffee is brewing, eat breakfast, and then I’m in the “office” between 6:30–7, replying to emails, having conference calls and getting things ready for new projects. I try to finish by 3 p.m., around the time my son is back from school. What’s the best part of the job? Meeting new people and visiting parts of the world that I don’t think I would’ve ever visited if I didn’t do this job — for example, opening Hyatt Regency Dushanbe in Tajikistan. I also just came back from opening Hyatt Regency Kuwait over the holidays. I end up working with many of the same people for every hotel opening, and it’s nice to do things together when we can, like bungee jumping off the highest bungee bridge in the world in South Africa!